Bookings for the Perodua Aruz have now climbed to 14,000 units since its launch in January, and the automaker says that it has delivered 4,000 units to buyers so far. Earlier this month, the company revealed that bookings had reached the 13,000-unit mark, so around 1,000 orders have come about in the two weeks since then. “This favourable reception by the Malaysian public both humbles and encourages us to work harder to improve our delivery times and serve customers better,” said Perodua president and CEO Datuk Zainal Abidin Ahmad. The automaker is also looking to gain more traction in East Malaysia, and aims for the Aruz to help it realise its ambition. 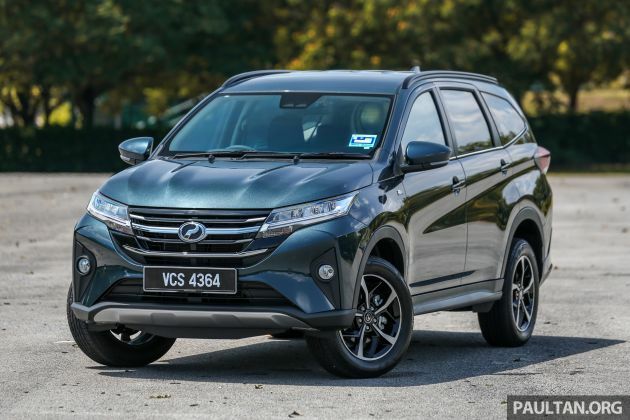 “Perodua is targeting to expand further its East Malaysian market share from 40% currently, and the Aruz will spearhead that expansion in this SUV-popular region,” he said. The company is currently showcasing the SUV via a Perodua Aruz TransBorneo Convoy event. Six units of the SUV are making their way from Kuching to Tawau on the 1,500 km-long drive, which began on March 16 and ends on March 22. Along the way, the convoy will be calling at major cities including Sibu, Bintulu, Miri, Kota Kinabalu, Ranau and Sandakan to engage with local communities and councils, allowing people to get up close to and experience the new Perodua SUV. 14,000 booking!! I can’t believe it guys!! The true Game Changer that have been proven. Habisla X70!! I cannot stop laughing. All the fake news about P2 now proven to be fake. Copy paste edited: “We are lucky to get good quality cars from Toyota Indonesia. Pity, 30 years we waited for good quality and high safety spec from our National car company but nothing came. Our resident keyboard warrior is disguising as Copy Paste and other names. So malu because he keep saying Aruz cannot sell but finally the truth has come. Habislah john! This is the reason why people buy Aruz. It uses a Toyota engine. Toyota engines are highly regarded by First World countries. Copy paste: “I want to buy a Malaysian car with engines invented by Malaysians. I am patriotic. I feel disgusted when I buy a Malaysian car that uses a Toyota ASEAN engine and a Toyota ASEAN body. poor john, still no modal. No shame? Why? Are you so ashamed now of what you repeatedly wrote previously? Hahaha! Dun care if u Hulk or Ironman or Cap Murica or Thor or Black Panther or Widow or Marvel. Avenger sir/madam, u just pawned him. Lolz! You mean Perodua did nothing and only tumpang glamour Toyota? MaluapaBO55kurr…. Chagan, Chana, Higear. Lotus also use Toyota engine what. Just now, I went to Perodua showroom. Surprisingly, the showroom was full of people standing in the line up to pre-order the Game Changing Aruz. Then, I went to Premium Geely Reseller showroom. Not surprisingly, the showroom is so empty I even can hear mosquito sound. Proven already, habisla X70! The true Game Changer coming soon. Aruz 14,000 since Jan 19. X70 20,000 since Oct 18. X70 took 5 months to reach 20k booking. Aruz took 2½ months (til today PT update) to reach 14k booking. Aruz if 5 months already 28k booking. Comparing apples to apples in the same time frame. The X70 has 3x more bookings within the same time frame despite being 2x more expensive. Clearly X70 is the winner, but the real winners are the rakyat who got a better deal thanks to Proton. Good Perodua big sales! Kipidap dongidap !! I want shorter 5 seater aruz. One month later only extra 1k bookings? This is veli worrying for the so-called game changer. Seems like interest is tapering off and many r changing their minds instead now they r preferring X70. Veli worrying indeed for Anuz. Flagging sales for Aruz. Only managed to get 1,000 more bookings, this is a disappointing result. Quite obvious why their sales people have so much free time to talk up their crap car in here. Our regular troll says Perodua sales are so bad. See, even without China’s help also, Perodua can do so well. They have no choice because they are treated like slave labour. I heard Aruz sales strong, Myvi and Bezza sales also strong. But as for Proton, only Proton X70 sales only strong. Saga, Persona, Exora sales kaput because all buyers migrate to Proton X70. Says the person whom cant afford premium vehicle with premium spec. If it makes u feel good brother…. X70 22,000 booking!!! I can’t believe it guys!!! The true Game Changer that have been proven. Habislah Aruz!!! Hey Roti, pls don’t compare to x70 la, this aruz is a VAN! People got confidence in the best car Malaysia has ever had! No wonder 21,000 had booked Proton X70. The best car Malaysia has ever had! Don’t be so happy. OF the 4000, some early owners have posted on facebook they had suffered propeller shaft snapped off and severely damaging the rear axles & suspensions. Now they are in Consumer Tribunal court to demand Perodua replace their lemon cars with a new car. I have never seen such failures in such a brand new car ever, but Perodua quality has seriously dropped to such a low point, it becomes a liability. Would-be owners better beware and think twice before committing. Yeah, I have seen the FB postings. At first I didn’t believe a brand new car can suffer such catastrophic failures but seeing the pictures and the first hand account by those unfortunate owners, I am convinced Perodua quality has suffered serious compromises in rushing out their rebadge to compete with Proton. Rush jobs is always never a good sign. I will never buy a Perodua car ever again for sure. Rush job on a Rush rebadge? What an irony. I have no idea what the person who wrote this was thinking. It’s like he was dead drunk. You know, like a drunken person can spend minutes trying to do some simple thing repeatedly over and over without really comprehending what they are doing. Proton X70 95% only sold in China. This is because all first world countries have rejected the Boyue, citing low quality. Tip of Sabah to tip of Sarawak still not reach 7,000km. From Sabah to Sarawak still no challenge. Padang Besar Perlis to hujung Johor, and even Singapore also not even reach 1,000km dude. Go back to school and learn geography. Failed! Which meant comparing the Proton X70 road trip to Hangzhou, Aruz “road trip” in Sabarh and Sarawak is like peanuts. Bro while X70 went overseas trip to see their boss in China, Aruz went to meet the local communities to entice them to buy the Aruz. So which marketing plan do you think works better? Proton testing sampai pergi Iceland, Australia, Artic…tapi sales makin jatuh jugak. I just drove my friends Aruz, it really feels so continental. Amazing feel. Ride and handling perfect. People buy Aruz because you get a high quality car that is RM50k cheaper than Proton. Quality and handling like Lexus? Hahahaha! Only Jap wannabe fanboys dream of Lexus when driving their crappy Peroduas. Yup. Same reason why many Perodua owners change their badge to Lexus. Malu nak pakai jernama Perodua tapi bodoh ingat boleh tipu orang lain. Manelah ada Lexus Myvi bah! Majority locals now can afford a 7seat SUV, all due Perodua Aruz hardwork and reliable Toyota technologi. Locals gotta be grateful with a clean and caring Malaysia administration. Petrol is cheap, stronk economi, excellent public transportations, best in region highway roads and many jobs everywhere. As a multi-racial country continue to live in peace and harmony , and sejahtera for all fellow Malaysians. I just drove one and I can assure you,it feels like a Lexus. Smooth. Maybe both also use Toyota technology and engines! This is an automotive website. Please keep your PH tooper politics out of this site. Wow, Aruz is selling well. People will definitely buy a car with a reliable Toyota engine. I am a seasoned observer of auto industry. Alwiz possessed fair and non biased view. the P2 Aruz, X70 and BRV are all selling well. Aruz = with dinosaur Toyoda engine enclosed in a Milo Tin Capsule = Poor Man SUV unlike the rest. I’ve seen only 2 aruz, one at aeon shah alam parking lot, one on the road near jalan kebun. But I’ve seen more than 10 x70 around shah alam, 2 in my housing area. Lower torque and lower HP compared to the Vios and Yaris engines..
P2 Sales smart strategy to gain and exceeded sales quota by telling same engine..
Basically they are conning the customers saying it is using Toyota engine but it’s not. Son: Daddy look! What car is that? P? Father: Dont know son, lets ask the lady there. Hi miss what brand car is this? Father and Son: Oh another rebadge car. Tak sangka Aruz lebih diterima pakai berbanding Rush. Kebanyakan pembeli di Sabah dan Sarawak akan bawa masuk jalan kampung & kebun yg masih belum tar dengan sempurna. Aruz memang sesuai dalam keadaan begini. Tapi kenapa bukan Rush? Harapnye Aruz akan ada spare part secepat mungkin. Tak seperti X70 yg kena stay berminggu-minggu tunggu spare part dari China sampai menggunakan kapal. This lousy cheap car so many bookings, after 5 years sure gearbox KONG a lot one, under power car with 1.5cc and such an elephant body. Good luck to Aruz owner, the history of 1.3cc Avanza going to repeat soon with a lot of gearbox KONG case after 5 years. Since Perodua success rebagde Rush, why not go step higher rebagde latest RAV4. Amacam ada brani. Since Perodua success rebagde Rush, why not go step higher rebagde RAV4. Amacam ada brani… no need to go until vellfire or harrier, nnt bising AP holder lak. PT, this time no comparison for 5 years ownership cost just like the sedan before? We like to hear P2 MD respond on this matter one more time. Dont! Later P2 supporters will get simultaneous heart attack and stroke when the truth is revealed their car ownership cost much more than their local competitor again. Perodua has success rebadged Rush. Why not take another step to rebagded RAV4, later can compete with X70.. Apple with Apple ma… Amacam, ada brani.. Tak perlu la sampai tahap Velfire, Harrier, nanti marah AP holder.